Correction: The original version of this article gave the final show date of Sweeney Todd as Nov. 7. It is in fact Oct. 7. The online version of this article has been changed. The Gazette regrets the error. When one hears the name Sweeney Todd the first image conjured might be a pale and eyeliner-coated Johnny Depp. Sadly, Neptune doesn’t give us Depp. What we get is the Demon Barber of Fleet Street. The Fountain Hall at Neptune Theatre compensates for its small stage (compared to Broadway) with wonderful acoustics, talented musicians and heartfelt portrayals of the ill-fated characters in Sweeney’s world. The tale of Sweeney Todd is one of revenge, murder and cannibalism. Benjamin Barker is a barber with a happy life and a family. His life is simple until despicable Judge Turpin sets his eyes on Barker’s wife. In a tragic turn of events, Barker is sent away while Judge Turpin causes the downfall and supposed death of his wife, and takes Barker’s daughter, Johanna, as his ward. 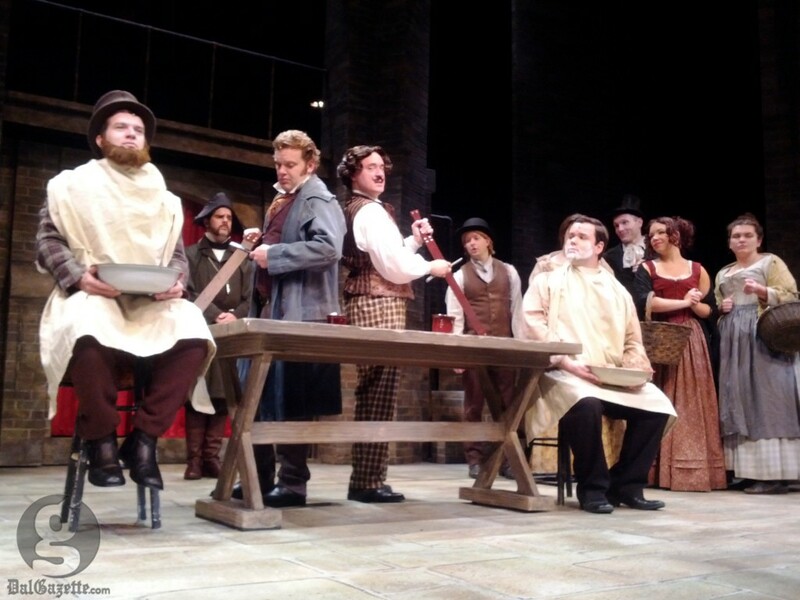 The play starts when Barker returns to London under the alias Sweeney Todd. His intent is revenge. He becomes reacquainted with the eccentric Mrs. Lovett, a pie-shop owner, who becomes his accomplice by using his victims to make human pies for her shop. As Sweeney moves closer to vengeance, the twists in the plot leave the audience chilled and eventually shocked by the outcome. The Neptune cast brings to life a play about vengeful deaths, and the very best performances came from Neptune debuts. Dalhousie graduate Ellen Denny’s performance of the imprisoned and innocent Johanna was the most captivating. Denny understood the dainty and neurotic Johanna. Many of Johanna’s songs were high-pitched, opera-style variation, but Denny nailed them with her soprano voice. The relationship between Johanna and Anthony (Patrick Cook) was the only bright light in a dark world, and Denny’s radiant performance highlighted that contrast. The role of Mark Allan’s character, Tobias, was understated. Yet Allan’s performance was colourful, making Tobias endearing and lovable. Shelley Simester, also a debutant, played eccentric Mrs. Lovett. Simester praised the character in an interview with the Gazette, saying she is “one of the best parts of musical theatre.” Her energetic performance showed the audience all the complexities of the sad Mrs. Lovett. Sweeney Todd, played by Shane Carty, entered the stage on a dory surrounded by mist. His singing was good, but it was as if he was a vessel for the voice and nothing more. Sweeney Todd is hateful and serious—he has the death of his wife and kidnapping of his daughter on his mind, so he is supposed to be contrite and secretive, but Carty takes it too far. He is not supposed to be the sleepy barber of Fleet Street. Carty’s rendition of ‘My Friends’ redeemed his performance. He captured the desperation and sadness at the core of his character. Accompanying musicians sat visible to the audience. The music and lyrics were written by Stephen Sondheim. Simester said the songs are wordy and often change metre. During duets, each character brought meaning to the song, but occasionally two different songs were blending, which distracted from the performance. Despite the slight downfalls, Sweeney Todd is a brilliant opener to Neptune’s golden anniversary.